WordPress 4.8 came with some awesome features to manage and customize your site. It added totally redesigned widgets, link boundaries and news of upcoming local WordPress events to your dashboard. When coming to posts and pages, media playlist is the notable change. It lets you add and play songs, videos right from your WordPress site. This is a very useful feature to express your interests and promote products. 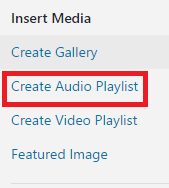 Let’s see how to create an audio playlist with WordPress. Create a new post or page to showcase your music player. Tap Add Media button from the top. You will see two new options in the left sidebar. Create Audio Playlist and Create Video Playlist. Tap Create Audio Playlist to create your music player. We don’t have any music files at this moment. So it shows No items found message. Click Select Files button to upload them from your computer. Choose your files and even multiple by holding Ctrl key and hit Open button. Wait until the upload is finished. After that, you will get the following kind of options. Type song title, artist, album name, caption and description for each song. Finally, hit Create a new playlist button from the bottom. Now it will ask you whether to show tracklist, artist name and images. 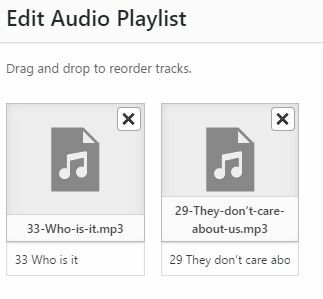 Check all and click Insert audio playlist button to show them in your WordPress editor. Currently playing song will be displayed on the top followed by album name and artist. Enter a name for the post and tap Publish. Open your content in a new tab and see how it works from the front end. Visitors can listen to music, fast forward and adjust volume there. In the same way, you can create video playlist also. For that, you have to opt for video playlist option in the first step (Check the first screenshot in this post). How to manage and edit a playlist? Open WordPress editor and click anywhere on your playlist to select. It will show a small pencil and X icons just above the list. Click X icon to remove the entire playlist. Tap pencil icon to edit the list. 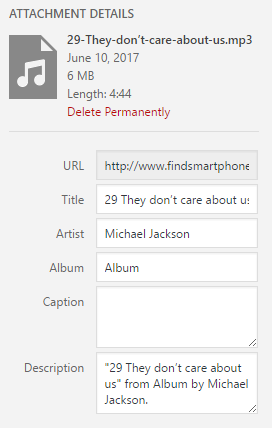 Tap X to delete a song from the playlist. Select a song to individually edit its details. Tap Reverse order button to change song order. After making necessary changes, hit Update audio playlist button to save your changes.